With more than 20 years of experience in some of the most prominent confectionary kitchens in the world, Executive Pastry Chef for The Cosmopolitan of Las Vegas and Master Chocolatier Vincent Pilon has carved his niche in the United States pastry scene. Pilon began his formal culinary training at L’école Jean Ferrandi, widely regarded as the leading pastry school in France. Here he developed a strong foundation in classic technique, which has forever served as the anchor for his creative pursuits. Pilon then attended L’école de Paris des Métiers de la Table where he expanded his scope into the versatile world of chocolate. After completing his training, Pilon worked in various pastry and chocolate shops throughout France before launching his career in the U.S. In 1997 Pilon landed a position in the kitchen of Le Palais du Chocolat in Washington D.C. and then worked under renowned pastry chef Francois Payard at the critically acclaimed Payard Patisserie and Bistro in New York City, before relocating to Las Vegas to pursue a career in the hotel industry. 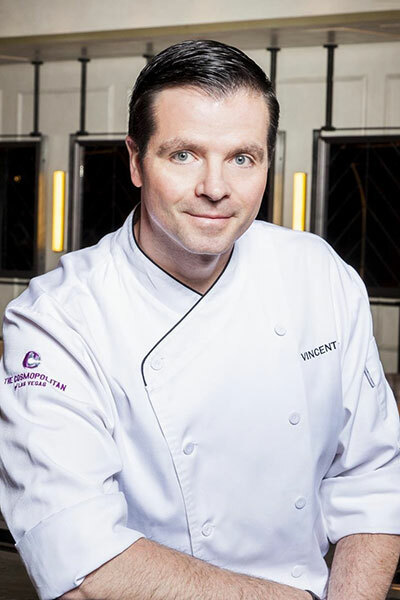 During his first 18 years in Vegas, Chef Pilon held positions in well-respected resort kitchens including assistant pastry chef at Bellagio, assistant executive pastry chef at the Rio, and executive pastry chef at Mandalay Bay Resort & Casino. During this time Pilon continued to master the art of chocolate, building a repertoire for award-winning chocolate structures. Now a talented member of The Cosmopolitan of Las Vegas’ culinary roster, Pilon has a hand in the ongoing development of the resort’s culinary in-room dining and VIP programming. Since implementing a line of chocolates exclusive to the hotel, Pilon looks forward to further elevating the detail-oriented approach to guests’ experiences that The Cosmopolitan has always been known for. Pilon has received several accolades for his work, including winning 1st place in the Food Network Challenge “Chocolate Series” 2005, 2006, 2008 and 2009, and the 1st place medal from US Chocolate Masters where he competed against the country’s top chocolatiers in 2007. He was also named one of the “Ten Best Pastry Chefs in America” by Pastry Art & Design Magazinein 2007 and 2008, and he now judges pastry competitions across the U.S.